Halloween is right around the corner, homes are decorated, costumes are ready and candy is stocked. Many children look forward to this one magical and fun night that only comes around once a year. If you child has a food allergy, Halloween probably feels different to them. Children who have allergies to foods like nuts, peanut butter, dairy or are gluten-free may not get to enjoy the candy they receive when trick or treating. 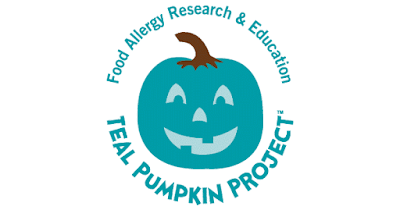 FARE'S Teal Pumpkin Project™ promotes the inclusion of all trick-or-treaters by raising awareness of food allergies. Simply place a teal pumpkin outside your front door or on your porch, this indicates that your household has non-food or allergy friendly treats available. 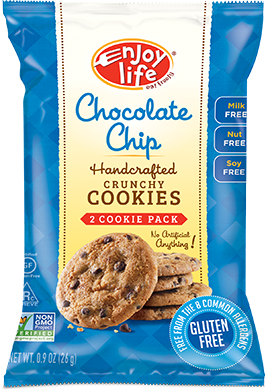 Enjoy Life Foods is our go-to company for gluten-free and allergy friendly foods! This year they are providing a safe, better-for-you allergy friendly Halloween treat - their Grab & Go Crunchy Cookies are perfect for your little trick or treaters! Grab & Go Crunchy Cookies are available in delicious flavors like Chocolate Chip, Double Chocolate, Vanilla Honey Graham and Sugar Crisp! I've seen so many fun Teal Pumpkin designs already this year, will you be participating? Be sure to stay connected with FARE on Facebook and Twitter!